Lake Coleridge intake viewing west to the Harper River. Picture taken on Opening Weekend 1968. Photo courtesy of Lyndsey Bishop. Over the years, I have enjoyed my share of success at Lake Coleridge, some of those successes, some of which were as a result of area knowledge while others were by experimentation. Looking back at Lake Coleridge revisited. 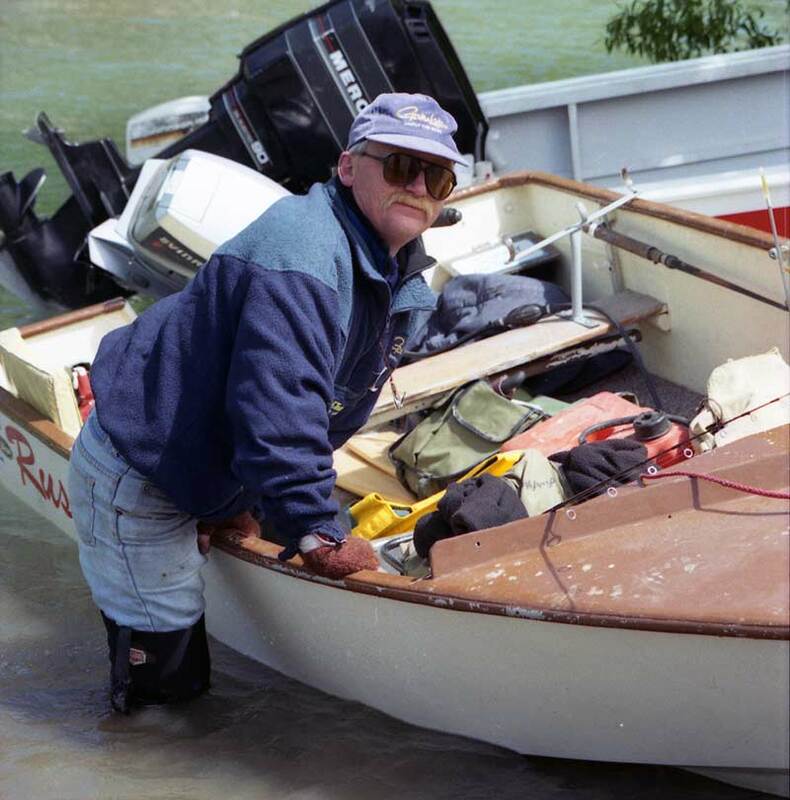 Good friend and colleague, John Hey and I planned a trip to the lake back in the early eighties, with the intention of exploring options other than the usual drive to the lake edge and fish. As we viewed the lake for the first time, there was the usual, almost common sight of whitecaps glistening in the early morning light, fed by a light nor-wester. 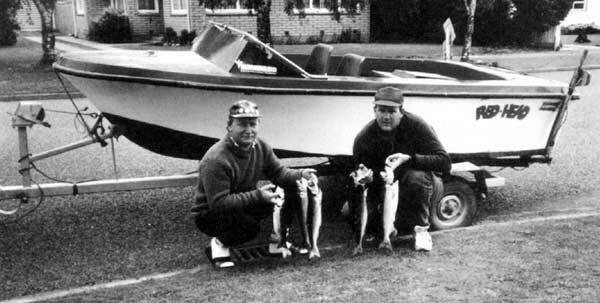 The author (left) together with Peter Woodham, display their fine catch of salmon taken at Lake Coleridge on opening day 1992. When nearing the lake edge we decided to fish our way around the Ryton Bay to the left, and if it was not productive, we would walk over the hill to Scamandar Bay where we could fish out of the wind. This suited John as he was intending to use his fly-rod, while I was happy to spin fish. 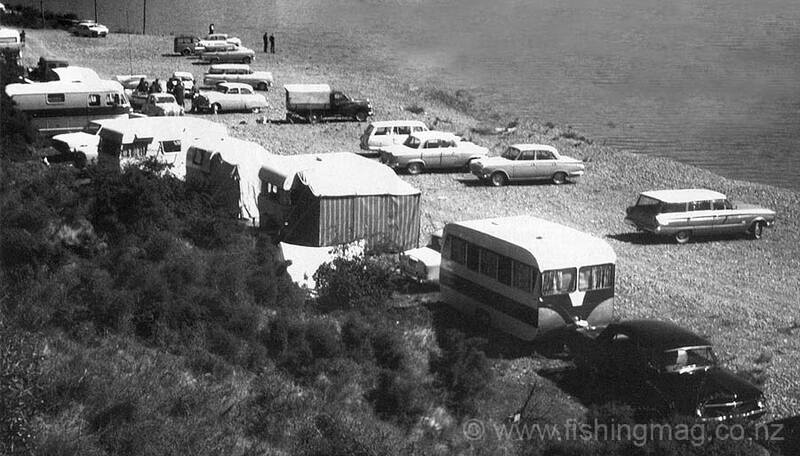 With no results from Ryton Bay, as we progressed our way round to the track, we watched in awe as three anglers set out in a fold-up Portabote for a spot of trolling. These conditions were far less than favourable for any boat, but we were powerless to advise them of the stupidity of their actions. It is hard to understand why anyone would choose to defy the elements and chance it on a lake with such a history of boating tragedies, especially when there was already a light nor-wester blowing. Dark clouds back in the Alps indicated that it would get worse before it got better. 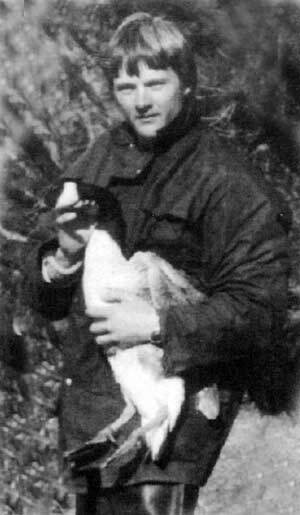 A youthful John Hey with a very tame, wild goose! The boaties meandered their way out and round the rocky headland of the Ryton Peninsula and out of sight, while John and I headed over the hill for the brief walk to Scamandar Bay. After sidestepping a few grazing cattle, we dropped down onto the beach and worked our way round to the left-hand side, to where a picturesque deep inlet folded its way back to a reedy valley. By this time it was around mid-morning and the sun reflected off the glass-like a deep blue bay. We had it all to ourselves and eagerly tried our luck. A couple of strikes and a few small fish followed, but the area was to provide more as a postcard photo option than a productive result fish wise. The deep drop-offs enabled me to use deep running trolling gear, which dives sharply when trolled or wound in from a cast. I experimented with a Hawg Boss Super Toad in rainbow colours, as these lures float until activated by movement. Upon rounding the point on our way back, I cast out beyond the shelf which extended out to about 15 metres where it dropped away to the deep. Winding the lure down to depth was the plan, as the Super Toad dives to about 12 feet. When the lure hit the bottom, I paused, allowing it to float up, and then drew it across the shelf. After a short duration, I took a huge strike. My pre-planned experiment paid off as a battle with a well-conditioned 5 lb rainbow came to an end with a big smile. Moments later, and not to be outdone, John took a big strike on the flyrod while fishing a fast sinking line and a wiggler nymph he had tied himself. Surprisingly, he too caught a 5 lb rainbow to scale, which squared us up! After returning to Ryton Bay, we packed up and decided to head up the Harper and try our luck with the wind behind us. We waded out onto the shelf at the Harper mouth, both spin fishing, and were soon to see some fun. With a basic brass ticer, I hooked into a sporty salmon of around 2 lb. I bagged that one, I had plans for that later (in short, I invited it to my place for a meal). With the weather worsening and rain showers becoming heavier, we made a hasty retreat for the car. Under the pines near the car, we spotted a Canada Goose, which appeared to be unable to fly. As we approached for a closer look, it was evident that it was quite tame, so much so that John picked it up and nursed it (see photo). Upon paying our respects to the wildlife, we set it free again, and commenced our journey homeward, tired but happy. Back in Christchurch, it was very warm. Quite the opposite to what we had experienced just two hours before. About five years earlier, my old mate Pete Woodham (formerly referred to as “second rod”) and I went into the Ryton for Opening Day. This was the first time I had the jetboat I then owned, “Redhead” on the lake. We headed out into the middle of the bay till daylight broke, then proceeded to troll across the bay, and on returning, headed around the peninsula to Scamandar, and on toward the homestead along the shores of Kaka Hill. Pete was into a salmon just as we headed out of Scamandar, and as we had been in the boat for about four hours, we decided to have a leg stretch and breakfast. With a light southerly rippling the lake, we found a beautiful bush clad inlet along Kaka Hill and here we settled for a spell. Fishing the steep drop-off into blue water was irresistible, although not productive. This surprised me, as the access to this area realistically was only by boat and a small stream trickling into the bay, bringing plenty of food supply with it, especially for cruising trout. 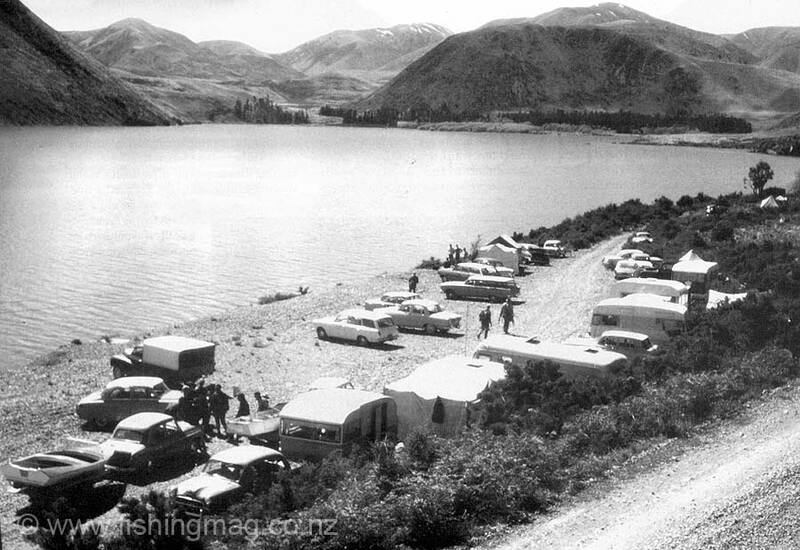 Lake Coleridge – east end. Picture taken on Opening Weekend 1968. Not a Toyota Hilux in sight. Photograph courtesy of Lyndsay Bishop. Although idyllic, we retained the memory and headed back toward the Ryton Peninsula. Knowing there is a rocky reef just off the outside of the Peninsula, I was obviously looking for it as we drew near. With the aid of a fish-finder, we noted that we were closer than we thought, as the depth rose sharply from 160 feet to 40 feet, then 12, 10, 8! Not wishing to gamble on the next reading, I immediately stopped and backed off, although we did, as it so happened, have plenty of clearance below us. Around the point, and we were into fish immediately, with five fish between us in close succession. This was achieved by entering the strike zone and following a figure eight course through the area where we started hitting fish. Many a time we saw boats stopping for fish, and after the landing net was retracted and its contents stowed, we then saw the boats continuing on their beat, generally away from the strike zone. By turning back, the trolling gear resettled to the right depth to pass through the strike zone again. This method can be very advantageous, as fish can be struck more frequently and economy boosted, through spending less time looking for more fish. Lyndsey with boat Rusty on Lake Coleridge on Opening Day. Click picture to enlarge. While fishing this method at Lake Benmore during November, I had my four fish limit by 9.30 am, just three hours on the lake. That left the rest of the day to relax and enjoy the surroundings. Pete and I returned to Ryton Bay and beached the boat in breezy conditions and discovered that Dad was there with only one fish. We encouraged him to come back out and just troll the bay, as the southerly was freshening and rain was setting in. The lake was just a little choppy inside the shelter of the bay and yielded both Dad and myself one more salmon each. His catch was two salmon, while Pete and I had three and four salmon respectively. These are landlocked salmon. At the Harper end the conditions favoured the shore anglers, as the boats, in the main, could not get out in the brisk breeze and rough conditions. This is where it pays to consider your options in the high country (now western zone) before you get there. Generally speaking, Lake Coleridge has been very kind to me in over 40 years fishing the area, but you, me, or anyone cannot afford to become complacent with the elements and the forces they can lay upon you. Do be careful up there, you may want to go back. Lake Coleridge Trolling. I suppose by now, many have had a feed of freshly caught whitebait, which at the time of writing this article, was just starting to make a small showing. I hope to get out and mix it with them a bit. This can be a great theme for a family outing, now the better weather is here, and a cheap feed can be had for little expense. I hope you have enjoyed Lake Coleridge Revisited. Best of luck with the new season, and I hope to see you all out there having a go! Allan’s Lake Coleridge Fishing Tips. Readers may be interested in taking a look at Lyndsey’s own website. You might just spot a few bargains! Check it out here at TackleSave.